Days of Our Lives (DOOL) spoilers tease JJ Deveraux’s (Casey Moss) story will be emotional. Expect a lot of conflict and fallout. However, it isn’t a clear-cut story. Even though some people will blame JJ for shooting Theo Carver (Kyler Pettis), is the victim really blameless? On Friday’s episode of the NBC soap, JJ arrived at the docks to see a suspect breaking into a warehouse. He told the suspect to freeze, not knowing it was Theo Carver. Instead of doing what he was told for fear of blowing the mission, he ran. Eventually, Theo had no choice but to stop. Still holding the device that opened the warehouse, which looks like a gun, he turned around. In his mind, he was surrendering, not realizing that from a distance, it looked like he might shoot. 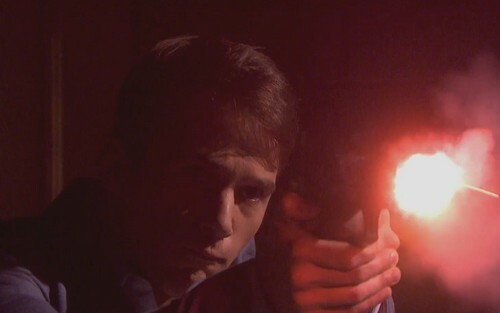 This resulted in JJ having to make a split-second decision and fired his gun. 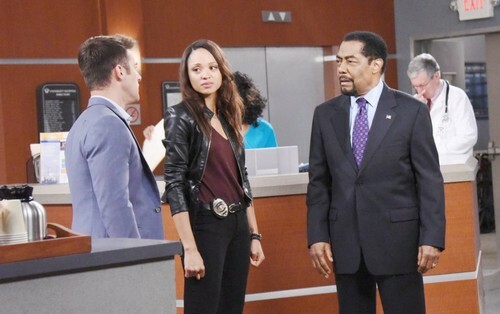 Days of Our Lives spoilers reveal that on Monday, JJ will discover the perp is Theo Carver. The detective is horrified, and things will only get worse. Everyone in Salem will have an opinion on the matter. Some will understand how the shooting happened. Others will only assign blame, creating division and wars between the Salemites. Expect serious conflict between the Horton and Carver families. Abe (James Reynolds) will also blame the DiMeras. It is an umbrella story that will air for the next several months. It will also lead to Kyler Pettis’ exit, but gives the option of a return or recast. What is interesting about the story is Abe Carver’s reaction. He goes into a rage, which scares Lani Price (Sal Stowers). It is understandable that he is upset since his son was the victim. However, he is letting his feelings cloud his judgment. He needs to look at the facts. It appears that Abe is forgetting his own history of shooting and paralyzing victims. One was an 8-year-old boy. Later, Abe would be sued. He would admit that shooting someone is something a cop never forgets. It stays with them forever and haunts them daily. Days of Our Lives spoilers tease that there will be conflict between Abe and JJ. The mayor doesn’t like the detective dating his daughter. He also knows that JJ tends to react without thinking. This was seen with Ben Weston (Robert Scott Wilson) in the interrogation room. Abe believes that JJ is reckless. Since he already dislikes JJ, this will only fuel the flames. Only time will tell if Abe will use his power as mayor to make JJ pay. What do you think of this controversial storyline? Keep watching the NBC soap and check back with CDL for the latest Days of Our Lives spoilers, updates and news. Is Theo An Innocent Victim?